BRT systems are destined to flounder in American cities when a key element of BRT, the exclusive lane, is omitted. Image by Erik Weber. Bus rapid transit (BRT) is still a relatively novel mode of public transit, particularly in the United States. And because the definition of BRT is flexible, this form of public transit often suffers from miscommunication that continues the cycle of misinformation that spurs poor transit investment choices and disappointment among public transit riders and personal vehicle owners. Earlier this week, the Atlanta Journal-Constitution covered the opening of the new BRT lines in Atlanta, Ga. While this new public transit service is certainly a step forward for Atlanta (one of the most congested and car-dependent cities in the U.S.), the system is not terribly remarkable in the world of BRT. Instead, the media coverage in the Journal is interesting for several reasons. As the AJC explains, the routes Q Express and Q Limited run along a main corridor on the east side of the metropolitan area and connect at their west terminus with Atlanta’s MARTA rail system. The lines feature queue-jumping lanes at two major intersections and signal priority, allowing buses to get ahead of traffic at red lights and holding green lights until they pass through an intersection. The lines have significantly fewer stops, placed at least three-quarters of a mile apart, a feature which even some light rail systems have not managed. [The Q Lines are] not like the gold standard of BRT, routes like those in Ottawa and Cleveland, which have their own dedicated lanes. That’s because the gold standard costs its weight in gold to build, considering the land that has to be bought and the construction required to create an extra lane. In that short paragraph lie both confusion in BRT communication as well as progress in how American media portray this form of transit. The Journal-Constitution article acknowledges up front that the Q lines in Atlanta are not the highest level of BRT. This tempering of expectations helps prevent the disappointment that has soured transit advocates to BRT in many cities where benefits were oversold. Small investments in BRT infrastructure certainly won’t deliver all of the benefits of full-fledged BRT likened to rail, but they cost significantly less. An even more important point that the AJC did not directly emphasize, though, is that BRT investment is scalable: Initial investments can be built upon incrementally as funding, political will or ridership necessitates to produce better service. The benefit of most BRT infrastructure is underscored by the fact that it can combine and streamline projects, reducing costs. Atlanta added queue-jumping lanes to the intersection because there was already a streetscape project underway at these junctions. Other cities would do well to learn from this. The growing American focus on BRT has become mired in a heated “rail vs. bus” debate that often pits transit advocates against each other, allowing bus rapid transit to be hijacked by budget hawks who care very little about delivering good quality transit service. This debate has come to focus almost solely on judgments around whether buses can be as comfortable as rail, whether they spur development equivalent to rail and whether buses carry some stigma that rail does not. These questions cannot be answered definitively given the variables involved. Instead, we should be focusing on the objective differences between bus and rail infrastructure. Possibly the most important of these is the scalability of bus systems. With buses, cities can do as Atlanta has with a small initial investment on technological improvements and minimal road space reallocations. Once these improvements attract additional ridership, you can begin to build support for further investment, perhaps rush-hour restricted bus lanes that allow mixed traffic during other times. Some time thereafter, an agency may be able to budget money to add nicer stops, or even stations, with arrival time displays, ticket vending machines, and so on. Eventually, support and ridership is such that you can justify large investments in high-capacity buses and curb-separated lanes, creating truly high-level bus rapid transit. Going a step further, Brisbane, Australia has even designed its busways to be easily convertible to light rail in the future. With a rail system, this incremental investment is much more difficult, if not impossible. You can’t put rails in the street without also installing the overhead catenary infrastructure. Unless a city already has surplus rail cars, those must be purchased simultaneously. Installing rails usually requires full-depth reconstruction of right-of-way. Long story short, there are a lot of major investments, most of which must be made simultaneously. Of course, in many cities where there is large pent-up demand for transit service, these large investments are likely worthwhile. In far more cases, though, cities have only marginal additional demand that don’t merit huge one-time investments. Far too many American cities still miss the point about road space priorities. In that one paragraph she wrote in the Journal-Constitution article, Ms. Hart says that the high-level BRT systems are costly because “land has to be bought” and cities must “create another lane.” High-level BRT can be an inexpensive alternative to rail precisely because it doesn’t require a new lane. And there-in lies the problem: Because most U.S. cities lack the political will power to reallocate road space from cars, they are left finding new space for transit, and suddenly costs skyrocket. After all, “gold standard” BRT isn’t expensive because of new right-of-way. (Cleveland’s Health Line, which the article cites as high-level BRT, used existing road space.) It’s expensive because cities are willing to invest in a lot of infrastructure at once which results in truly high quality transit. Yes, from behind the wheel of your stopped single-occupant car, a well-functioning bus lane looks empty most of the time. 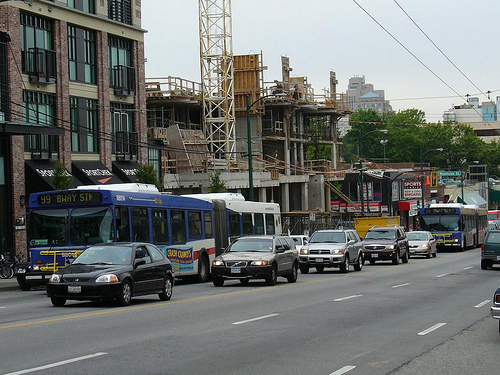 But at high-demand times, bus lanes easily move far more people than traffic lanes. The question is: do all the users of the road matter equally? If so, it should be a no-brainer to provide faster travel times to people who use limited capacity more efficiently. One traffic lane can accommodate approximately 60 buses or 1,800 automobiles per hour. Assuming a capacity of 60 passengers per bus, and an average occupancy of automobiles of 1.59 passengers, bus lanes can carry 3,600 passengers per hour, while a mixed traffic lane will only achieve about 2,900. If you add articulated buses, which have a capacity of 110 passengers, the capacity of a bus lane is even higher. If these efficiencies aren’t fully communicated, it will be next to impossible to justify to policy makers taking a lane of road away from private vehicles, and even harder to justify such changes to the drivers. New right-of-way is indeed expensive, leaving many cities to implement their BRT systems in mixed traffic, to the ultimate disappointment of customers who are often promised “rail-like” priority. Rapid bus service still suffers from communication problems. It’s been around since the 1970s and its time we start accurrately depicting the costs and benefits of these systems. These problems range from the misunderstanding that BRT requires new right-of-way, to the little trumpeted benefit of accommodating smaller, incremental investments, and the misconception that anything labeled BRT will automatically run like a “train on tires.” More in-depth reporting will help alleviate this problem. Even the Atlanta Journal-Constitution article, despite slightly misrepresenting the issue, will result in better communication by cities and transit agencies.